I was starting to worry about my coffee tour postings. I was sure giving out quite a few good scores - lots of 4 somethings. Am I being too nice? Should I be more critical? Are people really going to keep reading if I only give good reviews. In reality don't I want to give just good because then I'm not enjoying my coffee experience? Also, we must keep in mind that at the start of this tour I'm going to all the popular places, so of course they'll be good. However, something different for you today. Another thought before I begin. I'm sitting here in Indio, CA Christmas vacation and realized that Seattle really is quite special when it comes to coffee. Here you'll find Starbucks, Coffee Bean, and It's a Grind, but these are all bigger chains. There isn't a whole lots of small, independent coffee shops. Startle is unique when it comes to coffee. It truly is the coffee capital. And another realization...I'm turning into a coffee snob. On that note, let's launch into my next review. The Order: I got a cappuccino. Josh got a mocha. General Babble: This has been my least favorite experience so far while on this tour. Josh found Zoka online after typing "Seattle coffee roasters." he wanted to go to a place that roasted their own coffee. When we walked into the store, we found it to be very spacious, but somewhat stark. For instance, Their were bookshelves in the back of the store, but they were empty. Why have book shelves with no books? There were a few kickers for me: (1) The price. Now I know coffee is expensive, especially the fluffy kind I get, but this seemed more than others, even Starbucks. (2) The wait. We were only the second in line but we waited quite a while for our drinks. Then, when ours was finally ready some guy the came in way after us grabbed the drink - probably Thinking he had waited the normalfor drink waiting time, not realizing they were just that behind. He was nice about it and gave. It to Josh when he realized. (3) The quality. After points #1 and #2 I just made, you'd think the drink would be awesome. No. My cappuccino was a sad little sight to see. There was also hardly any foam. The taste..ugh. Burnt! Being that I paid for this drink, I decided to bring it back. When i approached the barista guy, i could tell he was struggling. Newbie. When I returned it, the guy. A was at register had left the customers in line to help out. He whipped out my cappuccino in no time. Much, much better. Was that review harsh and unforgiving? No, but it was the most negative thus far. 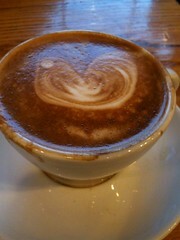 Overall Visit: 2.5 - I hate having to bring coffee back to be remade. Worse having it remade and and then still being slightly disappointed (the foam is key to the cappuccino). 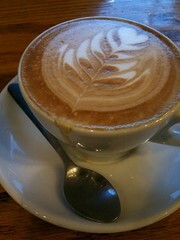 Or perhaps the cappuccino from Aster the day before, which I l-o-v-e-d, made this one pale in comparison. Latte Art: 2.75 - The first cap I got was just sad. The second was good which is why this score got the .75 added to the 2. Atmosphere: 3 - It was just a bit cold (not as in the temp), but the feel. Drink Options: 3 - Just the standard options. Nothing more, nothing less. Coffee Knowledge: 3 - I didn't get the chance to ask the guys very many questions about the coffee, but the website is full of information. They roast their own beans, but you couldn't see any of the roasting at the store we visited. They use their Espresso Paladino on their lattes. It was smooth, but the coffee wasn't singing in cup. Good but nothing to rave about later. Food: The food was pretty good. Nothing to remember. It was Essential Bread Co. Which I usually really enjoy. However, their goodies seemed to lack the EBC umph of flavor, or maybe it was that they were day-old pastries. Who knows. It was good, but not spectacular.